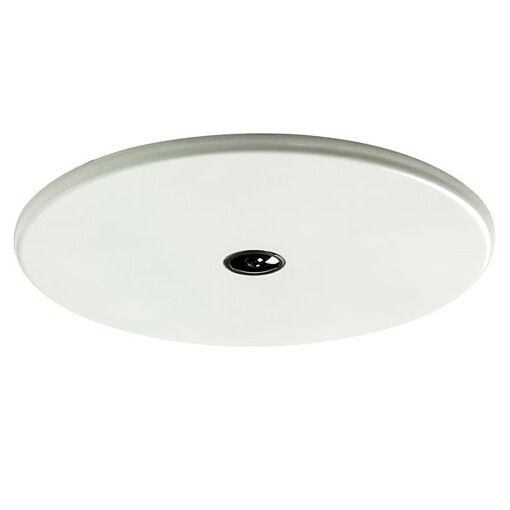 This discreet, aesthetic camera mounts flush in a ceiling or wall. Its easily-painted cover plate blends in with almost all surroundings. The 12MP sensor operating at 30 fps provides full panoramic surveillance with complete area coverage, fine details and high speeds. The camera offers full situational awareness and simultaneous E-PTZ views in high resolution. The 360° version of the camera, when mounted centrally on a ceiling, gives complete wall‑to‑wall coverage. The 180° version has a higher effective resolution and is ideal for wall mounting or for ceiling mounting in corridors. The lens captures a circular image. Our dewarping software transforms this circular image into several different distortion-free rectangular views. To facilitate system integration, you can choose edge dewarping inside the camera or client-side dewarping on an external platform. The freely available Video Security Client from Bosch provides advanced client-side dewarping features. Advantages of panoramic surveillance Panoramic surveillance offers full 180° or 360° coverage of the designated area. Because our panoramic cameras cover the full area, they provide complete situational awareness and are ideally suited to following movement in one continuous sweep. The ultra high 12MP sensor resolution together with the exceptionally high frame rate of 30 fps makes this camera unique in the field of panoramic image capture. Motion is smoother and the E‑PTZ feature provides more detailed images. The effective resolution for the 180° version is 8MP and for the 360° version 7MP. The built-in video analysis reinforces the Intelligenceat-the-Edge concept and now delivers even more powerful features. Essential Video Analytics is ideal for use in controlled environments with limited detection ranges. With client-side dewarping, the camera streams a single circular non-dewarped image at 30 fps. Dewarping is performed with our dewarping software that is installed on the PC where multiple view modes are available or you can choose to use a third-party client-side dewarping software solution. Different view modes can be selected for the video 2 channel. Your selection depends on the resolution you require and how you wish to view the dewarped image. The following view modes can be selected at 12.5 fps with edge dewarping or 30 fps with our client side dewarping. ensures that details are not lost even when using the electronic zoom. With edge-dewarping you can also choose to only record the relevant parts of the scene which helps reduce bitrates significantly. Intelligent Dynamic Noise Reduction adjusts spatial and temporal filtering (3DNR) based on intelligent analysis of the scene content. Motion compensated temporal filtering (MCTF) reduces motion blur normally associated with standard temporal filtering. This maintains image quality of fast moving objects while still optimizing bitrate. Area-based encoding is another feature which reduces bandwidth. Compression parameters for up to eight user-definable regions can be set. This allows uninteresting regions to be highly compressed, leaving more bandwidth for important parts of the scene. Area-based encoding is only available with client-side dewarping. The dynamic range of the camera is outstanding and is obvious in real-world performance comparisons — 92 dB wide dynamic range (plus an extra 16 dB when combined with Intelligent Auto Exposure). The actual dynamic range of the camera is measured using Opto-Electronic Conversion Function (OECF) analysis with a standardized test chart based on ISO standards. This method provides more realistic and verifiable results in comparison with the theoretical approximations sometimes used. To optimize image quality, eight zones for measuring the exposure can be drawn on the full image circle and assigned a priority level. These zones are given a higher or lower priority when the camera calculates the exposure level. This ensures that the important areas of the scene have the ideal exposure level. Fluctuations in backlight and front light can ruin your images. To achieve the perfect picture in every situation, Intelligent Auto Exposure automatically adjusts the exposure of the camera. It offers superb front light compensation and incredible backlight compensation by automatically adapting to changing light conditions. Flush-mount design for easy unobtrusive installation The flat-profile design of the camera makes it exceedingly suitable for installations where unobtrusive surveillance is required. The thin cover plate fits flush with any mounting surface, and its ecoating is easily painted to blend with most surroundings. The discreet high quality IR corrected lens is factory focused and is not restricted by a bubble, so installation is simplified and sharpness is assured. Power for the camera is supplied via a Power-over-Ethernet compliant network cable connection. With this configuration, only a single cable connection is required to view, power, and control the camera. The camera has a very intuitive user interface that allows fast and easy configuration. Nine configurable modes are provided with the best settings for a variety of applications. Different scene modes can be selected for day or night situations.